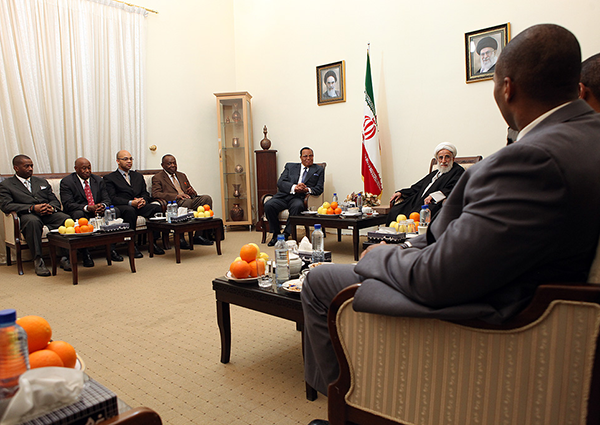 Ayatollah Ahmad Jannati receives Minister Louis Farrakhan and delegation from Nation of Islam at Guardian Council, 37th Anniversary Celebrations of Islamic Revolution, February 2016. A live audio-recording of Elijah Muhammad’s lecture confirms the veracity of this statement. Dr. Wesley Muhammad speaks on Saviours' Day about teaching Iranians about the Mahdi. For a transcript please click here. Concerning doctrinal issues about the nature of Allah and the identity of the Mahdi, I refer you the 12th point of the Nation of Islam’s Muslim Program. Read the full Muslim Program of the Nation of Islam. The 12th point—the witnessing that Allah appeared as a man named Fard Muhammad—is affirmed in almost all the invocations, sermons and publications of the Nation of Islam. An Interview about the Great Mahdi, Master Fard Muhammad. For a transcript click here. The Honorable Minister Farrakhan's interview with Press TV about Ayatollah Jannati. For a transcript please click here. I refer you to the following passage “Minister Farrakhan in Iran” published in The Final Call, the Nation of Islam's website on March 2, 2016. The Final Call editorial on the Nation taking the doctrine of the Great Mahdi to Iran. Minister Farrakhan was also the guest of honor at the Center for Strategic Research. He held a joint press conference on February 9th, 2016 with Dr. Ali Akbar Velayati, the former Iranian foreign minister, and a close advisor to Iran's supreme leader. Dr. Velayti apparently referred to Minister Farrakhan as the new Bilal. The Honorable Minister Farrakhan's joint press conference with Dr. Ali Akbar Velayati, former foreign minister and advisor to supreme leader. Center for Strategic Research, Feb 9, 2016. The Nation of Islam delegation departed for Iran on February 6th and returned to the United States on February 14th. The Honorable Minister Farrakhan was the featured speaker at the 17th anniversary celebrations of the Islamic revolution in February 1996. He has also been a frequent guest of successive Iranian presidents, foreign ministers and ambassadors, all of whom have embraced him as their Muslim brother. 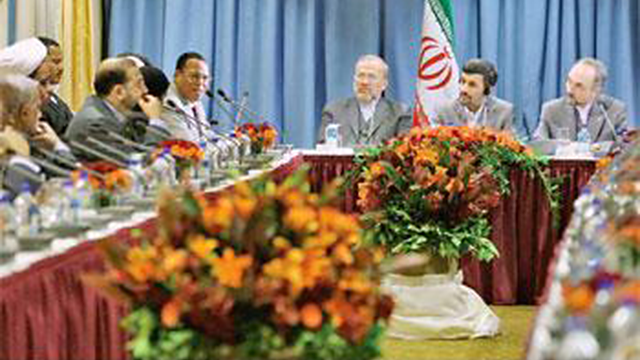 Minister Farrakhan and President Ahmadinejad meeting in New York in 2012. Farrak speaks at dinner in NY, September 2010; in center, Iranian Foreign Minister Manouchehr Mottaki, Ahmadinejad, Iranian Ambassador to the U.N. Mohammad Khazaee. Zahra is the heroine of Zahra’s Paradise, a graphic novel about Iran’s 2009 presidential elections. Zahra ran on a human rights platform as a virtual candidate in Iran’s 2013 presidential elections.